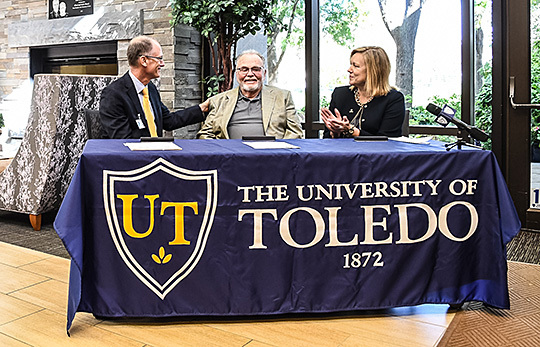 Toledo businessman Hal Fetterman and his wife, Susan Fetterman, have pledged $1 million to The University of Toledo to fund new research into treatments for pancreatic cancer, the third leading cause of cancer death in the United States. The donation is in honor of Hal Fetterman’s sister, Joyce Schwyn, and three close friends who lost their lives to pancreatic cancer. Hal Fetterman, center, was thanked last week by Dr. Christopher Cooper, executive vice president of clinical affairs and dean of the College of Medicine and Life Sciences, and President Sharon L. Gaber after signing a pledge to give the University $1 million to research pancreatic cancer treatments. The Fetterman’s donation will establish the UT Medical Center Pancreatic Cancer Research Innovation Fund. Half of the gift will be dedicated to recruiting a top-tier faculty researcher to the UT College of Medicine and Life Sciences. The remaining $500,000 will be split between covering the costs of an upcoming clinical drug trial at UT Medical Center and supporting a grant competition among faculty cancer researchers. Pancreatic cancer is relatively rare accounting for just 3 percent of all new cancer cases in the United States, but it is to blame for 7 percent of all cancer deaths. According to the National Cancer Institute, only lung cancer and colon cancer kill more Americans than pancreatic cancer. Dr. F. Charles Brunicardi, the John Howard Endowed Professor of Pancreatic Surgery and director of the cancer program in the College of Medicine and Life Sciences, said there is already promising research being done at UT, and the Fettermans’ gift will take it to the next step. Fetterman felt it was important that someone make a sizeable donation to draw more attention to the cause and hopefully additional resources to advance treatment options. The Fettermans are longtime supporters of UT. In 2007, the couple donated $1 million to the UT Athletic Department to build an indoor multi-sport practice facility that would ultimately become the Fetterman Training Center. They also established the Scott Raymond Fetterman Memorial Scholarship Fund in 1996 for UT engineering students. This entry was posted on Monday, October 15th, 2018 at 3:52 am and is filed under Advancement, Medicine and Life Sciences, News, Research, UTMC, UToday .